There are 7 isoforms of Shugoshin with the following sizes: 64kDa, 58kDa, 34kDa, 32kD, 30kDa, 28kDa, and 24kDa. The immunogen used for this antibody is present in all isoforms. This antibody interacts with several proteins in the unsynchronized cell lines tested, with the most prominent bands in the range of 30-34kDa. The cell samples may need to be synchronized to detect the larger isoforms (see PLoS Biol. 2005 Mar;3(3):e86). These bands are competed away by addition of the immunizing peptide. Synthetic peptide conjugated to KLH derived from within residues 1 - 100 of Human Shugoshin. This antibody gave a positive signal in HeLa Whole Cell lysate. Our Abpromise guarantee covers the use of ab21633 in the following tested applications. WB Use a concentration of 1 µg/ml. Detects a band of approximately 64 kDa (predicted molecular weight: 64 kDa). IHC-P 1/350. Perform heat mediated antigen retrieval with citrate buffer pH 6 before commencing with IHC staining protocol. Plays a central role in chromosome cohesion during mitosis by preventing premature dissociation of cohesin complex from centromeres after prophase, when most of cohesin complex dissociates from chromosomes arms. May act by preventing phosphorylation of the STAG2 subunit of cohesin complex at the centromere, ensuring cohesin persistence at centromere until cohesin cleavage by ESPL1/separase at anaphase. Essential for proper chromosome segregation during mitosis and this function requires interaction with PPP2R1A. Its phosphorylated form is necessary for chromosome congression and for the proper attachment of spindle microtubule to the kinetochore. Necessary for kinetochore localization of PLK1 and CENPF. May play a role in the tension sensing mechanism of the spindle-assembly checkpoint by regulating PLK1 kinetochore affinity. Isoform 3 plays a role in maintaining centriole cohesion involved in controlling spindle pole integrity. Widely expressed. Highly expressed in testis. Expressed in lung, small intestine, breast, liver and placenta. Strongly overexpressed in 90% of breast cancers tested. Belongs to the shugoshin family. Appears in prophase cells and remains present until metaphase. Strongly decreases at the onset of anaphase and completely disapears at telophase. Not present in interphase cells (at protein level). The KEN box and D-box 3 are required for its ubiquitination and degradation. Ubiquitinated and degraded during mitotic exit by APC/C-Cdh1. Phosphorylation by NEK2 is essential for chromosome congression in mitosis and for the proper attachment of spindle microtubule to the kinetochore. Phosphorylated by PLK1 and AUKRB. Nucleus. Chromosome > centromere. Chromosome > centromere > kinetochore. Cytoplasm > cytoskeleton > spindle pole. Cytoplasm > cytoskeleton > centrosome. Localizes to the inner centromere throughout prophase until metaphase and disappears at anaphase. During prometaphase, it localizes to a single focus, while at metaphase, it localizes to 2 spots corresponding to the 2 centromeres. Centromeric localization requires the presence of BUB1 and the interaction with PPP2R1A. Localizes to the inner kinetochore from prophase to early metaphase. Co-localizes with NEK2 and SS18L1 at the kinetochore. Phosphorylation by AUKRB and the presence of BUB1 are required for localization to the kinetochore. Isoform 1 primarily localizes to kinetochores during G2 phase and mitotic prophase, metaphase, and anaphase and does not appear to be associated with kinetochores during late mitosis. Isoform 3 is found at the centrosome in interphase and at spindle poles in mitosis and its spindle pole localization is PLK1 dependent. Isoform 3 does not localize to kinetochores during any stages of the cell cycle. Additional bands at: 34 kDa, 37 kDa, 40 kDa. We are unsure as to the identity of these extra bands. 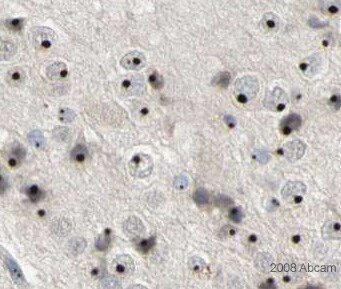 ab21633 staining Shugoshin in Human hippocampus. Paraffin embedded human hippocampus tissue was incubated with ab21633 (1/350 dilution) for 30 mins at room temperature. Antigen retrieval was performed by heat induction in citrate buffer pH 6. Publishing research using ab21633? Please let us know so that we can cite the reference in this datasheet.